More than 30 years ago, Hardwick’s fire department moved into a warehouse-style building on Wolcott Street and abandoned its original Victorian-era firehouse in the center of town. 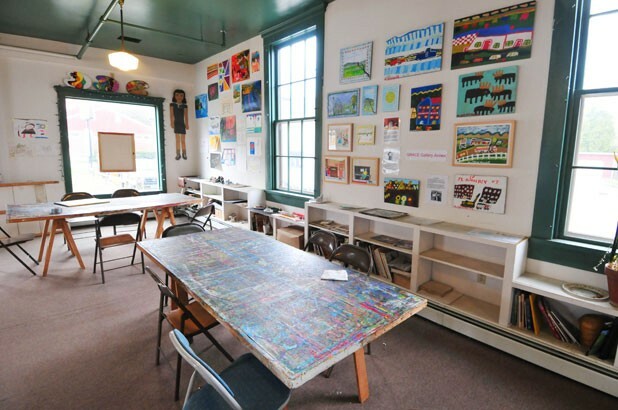 Instead of housing hose-and-ladder trucks, the Old Firehouse, a sage-green and brick-red clapboard structure with a second-story bell tower, is now home to GRACE, Grass Roots Art and Community Effort, a nonprofit organization that offers art workshops for disabled and elderly Vermonters. The first floor is an open-studio space, with five paint-splattered plywood tables on sawhorses surrounded by folding chairs. Art displays are arranged salon style, chock-a-block on the walls. Though many are the creations of the most recent community workshop participants — including a deep purple, finger-painted piece on white paper — there are also works on view by a couple of GRACE’s most popular artists, Merrill Densmore and Dot Kibbee. The two artists’ aesthetic tastes couldn’t be more different. The late Densmore applied paint in heavy splotches; Kibbee is partial to delicate, ethereal treatments of nature. In a painting currently on display, Densmore depicted two blotchy-looking apartment buildings that lean this way and that, with “St. Johnsbury” scrawled across the top. Kibbee’s canvas, by contrast, offers a breathy evocation of spring: Trees leafing in puffs of light green float against a sky-blue background. While not all visitors will be familiar with the likes of Densmore and Kibbee, nearly everyone has heard of Gayleen Aiken. The late Barre artist’s colorful, cartoonish drawings of her family home and portraits of her fictitious Rambilli cousins have been shown at galleries around the state, as well as nationally, through GRACE. The nonprofit, known for its “outsider art” exhibitions of works by untrained artists such as Aiken, dedicates most of its resources to programs for elderly and disabled adults. GRACE offers about 500 art workshops to more than 200 Vermonters each year. While the exhibitions often generate publicity and donations, the more low-key workshops, held throughout northern Vermont, aren’t cheap to offer. Though the art programs are partially subsidized by nursing homes and mental health agencies, the session fees don’t cover the costs of art materials and staff time. Until recently, GRACE received enough grants and donations to support both aspects of its work. But this year the nonprofit hit a financial rough patch. “We’re under the same financial stress every other nonprofit group is going through,” acknowledges board president Stephen Ferber. Art sales and donations have declined, workshop subsidies are faltering, foundation grants have dried up, and GRACE’s small endowment has lost money on the stock market. Managing director Carol Putnam says the organization’s revenues are down by about 20 percent, and it needs about $50,000 to meet its operating expenses this year. GRACE has applied for a $25,000 grant in direct program support through the National Endowment for the Arts’ special stimulus funding, and has formed a finance committee to shore up its $170,000 annual budget with additional fundraising events. But Hemmens says the nonprofit can’t keep cutting that budget without eliminating jobs and workshops. The five staffers, all of whom work part-time, hold workshops at the Old Firehouse in Hardwick and at nursing homes and mental health facilities in Burlington, Colchester, Newport, Morrisville, Waterbury, Northfield and St. Johnsbury. In addition to lots of encouragement, the staff supplies the artists with high-quality materials — oil paints, colored pencils, acrylic paints, pastels — but doesn’t force participants to take instructions, or criticism. In a GRACE workshop, there’s no right or wrong way to make art. Standard ideas about color theory, perspective and composition take a back seat to creativity. In a Roland Rochette painting of a sugar woods, for example, the maple trees are arranged in rows, each one with a bucket hanging in the same position. Aiken, who died in 2005, often included text in her drawings of characters interacting and making music. Sometimes she wrote dialogue in thought balloons above the figures’ heads; in other cases she placed running commentary in the middle of a drawing. “We find ourselves more and more in the exhibition business when we’re really in the service delivery business,” Hemmens comments. Ironically, another problem is lack of visibility. GRACE has won international cachet — the program’s work is being replicated in Ireland — and national kudos. Aiken’s work has been exhibited at the American Folk Art Museum, and GRACE has been featured on CNN and Vermont Public Television. Still, Vermonters often are surprised to discover the nonprofit offers workshops, Hemmens says. While longtime board member Bertold Francke describes the organization’s financial situation as a “crisis,” Ferber is confident they’ll overcome it. If the NEA grant doesn’t come through, GRACE will apply for a smaller stimulus grant through the Vermont Arts Council. Though grant competition is especially stiff this year, GRACE has received funding from the federal government and the state in the past. The board is also “ginning up” more fundraising events and appeals.